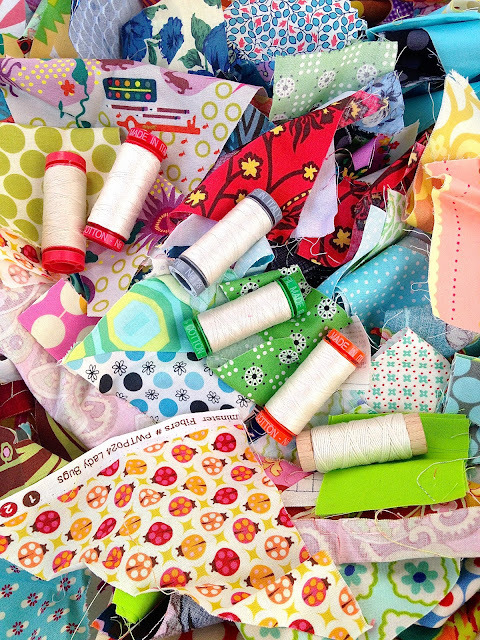 Scraps are a undeniable part of sewing. In the quilting world, scraps, for the most part, are AMAZING! Especially when you happen to be a scrappy quilter. The down side is that they accumulate and multiply at a pace that would make even the most productive bunnies blush! I am at this point in my sewing room, I have more scraps than I have sense. Last week my friend Susan from Instagram gave me the gentle nudge needed to not only organize but DO something with all of these fantastic scraps. First up is a GIVEAWAY! While sorting through the seemingly endless piles of epic fabric beauty, the idea struck me that not everyone has a stash of scraps or they do not have the same collections that I have been accumulating. I starting making a side pile. One to give away! The decision was also made to include an Aurifil sample set, it includes all of the thread weights and a bonus Aurifil floss for your hand stitching! The scraps included are from many designers and manufactures. There are many out of print and hard to find scraps included. The sizes are varied from tiny to really not tiny ;o) It is like a fireworks explosion at the end with all of the BEST stuff happens! In the coming weeks there will be ideas for storage, projects and maybe more giveaways ( I found even more scraps this morning) to keep you excited about not only organizing but really being able to USE your scraps! Susan is on Instgram only, if you do not know her...she is AMAZING! Prolific quilter does not even come close to what she is! She is a piecing machine! This is what she has been working on in just the past week! And look at that lovely pile of scraps in the upper left box! This first week we are just sharing our piles of scraps! How big are your scrap piles? 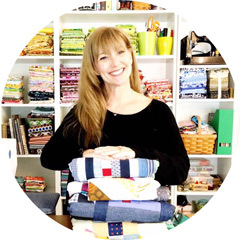 If you are on Instagram, Facebook, Twitter, Ello, or anywhere else ( there is always someplace new) and want to share your scrappy projects, ideas, organization or piles of lovely scraps please use the hashtag #bescrappy and tag me ( gogokim) and Susan so we can see what you are up to! The fabulous giveaway will be as many lovely scraps as I can assemble by Friday ( there are already almost a basket filled to the top) and a sample set of Aurifil thread! To enter for your chance to win, I will be using Rafflecopter with a few different ways to enter. You can just do one or to increase your chances of winning you can do all :o) The giveaway is open internationally and will close 23 April at 11pm EST. A random winner will be chosen through Rafflecopter on or about 25 April ( weekends are crazy here). Hi. My favorite scrap 'storage' tip is to throw them all in a shoebox and use them as quickly as possible. I don't really have a lot of scraps to store. I try to cut 2.5" squares from smaller pieces and I keep them in the jar! The rest of my scraps are in a massive bag hidden away because oh the SHAME!! I try to sort my scraps my colour and when their individual bins get full, I then try to make a scrappy project using that colour. I love scraps!! I just started collecting and I can't wait to start making fun, scrappy projects. I love to organize by color. I put my already iron and starched pieces in folders. I don't have any good storage tips; I try to use the scraps I like right away for potholders etc. I use clear plastic containers with lids (repurposed salad containers from Costco that I can stack on shelves) to organize all my scraps by colour and size. I like to cut, sort & store my scraps as I finish projects - which has the double benefits of keeping things tidy and to keep from having to re-press the same bits of fabric over and over. I keep my scraps sorted by color, plus a bag of multi colored prints that are too hard to sort. I would love to have a system of scrap storage but at the moment it is a huge canvas bag with them stuffed in as tightly as possible!!! I used ZipLoc bags so I can sort/see exactly what I have, color-wise. All the bags are placed in a Kraft-Tex "box" that I sewed up and in full view so as to encourage me to use them. I store my scraps in a couple of different ways. I have a wooden box for selvages which got overgrown so now there's a huge glass vase full of them and a wooden box. I store my cotton scraps in a metal basket so I can see them but they are starting to overflow and I'm going to need to start sorting by color. Next up is the hour basket which houses all my batik scraps and so far I've been able to contain them in the basket. Thanks for the giveaway and I can't wait to see what others are doing with their scraps! I cut my scraps into uniform sizes, strips, 3 1/2",5",7",10",when they start taking over too much. Not very creative but I'm kinda retentive that way. I know ironing them and sorting them by color is a sensible way to store scraps, but honestly, mine are chaos! Some are sorted by color, but few are cut to uniform sizes or anything like that. I use a lot of them for paper piecing so I really don't know what sizes I will need which makes me hesitant to cut them up. So I'm not one to take pointers from! I would say more of my projects are scrappy than not. I <3 scraps. 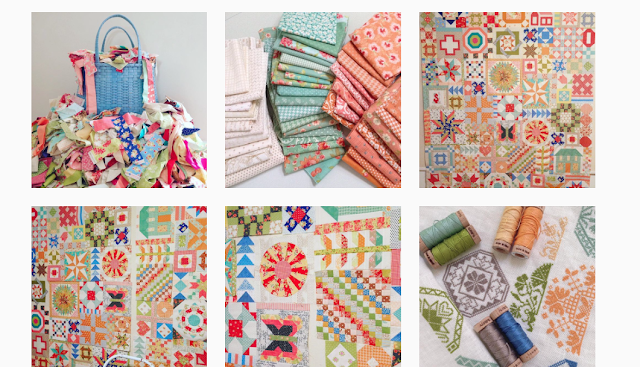 I love a good sampler quilt -- all scrappy. Good stuff all around. Actually, when we moved into this house, I built a cutting table made specifically to store my scraps beneath. I sort mine by color and size. I don't sub cut into to specific shapes. I just keep anything a fat eighth or larger together and then anything smaller I sort into strings, really smalls (around 2 1/2 in.) and then everything else. I have a specific project in mind that needs lots of 2.5" squares, so if I have a funny/odd shaped scrap and can manage it I'll try to cut one out. I also have plans for an epic EPP hexie quilt so I also try to eek one of those out of my scraps. Thanks for the giveaway! I am new to quilting (well the last time I did any piecing was 20+ years ago), and since my quilt cottons are piling up I need some help in the organization department! I try to organize my scraps by color. Looking forward to seeing what to do with my scraps. Thanks for the chance to win! I have mine sorted by color. It seems to work quite well. Thanks for the chance to win!! I like to cut them into manageable sizes and store them according to size...but then I also have two large bins that are just crammed full waiting to be organized too! I have smallish totes with lids. I keep strips in one, squares in another, and random pieces in a bigger one. I don't have enough just yet to justify separating by color, but that seems sensible if you're trying to find certain colors for a project. I also have begun a bin my kids can play with- they used to have access to all my scraps, but it was getting a bit out of hand. I have two small baskets of scraps. I use them mostly when I need to test a thread or a zig zag width. (I only pick out the ones I know I won't use :) Thanks for the chance. Love your scraps! Goodness, I have no system whatsoever....just a pile getting bigger after each project. Looking forward to getting lots of tips. I store my scraps in colour order in fabric baskets I've made. The fabric baskets are made in the colour of what scraps will be stored in it. I also currently store triangle cut offs in a jar, so I can admire them and can piece them together later without having to hunt for them. My scrapes are cut Bonnie Hunter style! I have one big tub. Not the best. I often wrap my scraps into my folded yardage. I store my scraps in a large plastic container and organize it by colour. Every year I go through it and reorganize it. I once had this great idea to cut some scraps into squares of different sizes but that was time consuming and I quickly lost interest. I cut 2.5" strips from leftover yardage and the rest go into a wicker basket for string piecing! I cut my scraps into the largest squares I can up to 5" and the rest I sort by colours . I keep long pieces for strip quilts and small odd shaped pieces for crumb blocks. Since I changed to this method I have found that I use my scraps much more than when they were just stuffed into a box. This is a timely series, I've just been organising my fabric collection to move house, put all my fat quarters and yardage neatly into some plastic tubs, but I have no idea how to organize all the scraps. Obviously I can't throw them out because they might be useful. Currently I have them all stuffed into a bag, help me! How fun! Right now my scraps are separated by color in drawers in my cutting table. Not sure how that is going to work long term. I love scrappy quilts. I try to use Bonnie Hunter's scrap organization system. I will admit to falling short on occasion. Thanks for the chance to win. I try to sort my scraps by color! I keep my scraps separated by color in a bin in the same color. And the bin is seen from scraps. I use a basket for the bulk and then a second bin for "weird" fabrics - like holiday themes or kiddie ones. And I put a sample of scraps in a ziplock for my kids to play with. I do not have an organizing system, right now. I do not have that many scraps. The super tiny ones are in a plastic bag and the bigger ones are in a Christmas tin. I definitely recommend sorting by color, but my most scrap friendly tip would be keep your scrap bins accessible. If you can just clear scraps right away into the (sorted) bins as you work, it doesn't become a hassle. I love working with scraps! I sort by colour and keep them folded in Ikea clear storage boxes. My local quit shop has huge wheeled baskets (skeps) of scraps, I love to dig in for treasure! Thanks for the chance to win! I use gallon sized ziptop bags for my scraps. I have 5 bags so far. I store my scraps in plastic shoe boxes by strip size. I like to sort scraps by color and I store them in plastic bins that I can see through. I don't have one. This series is just what I need to get organized. Thanks for sharing. I store my scraps in plastic baskets that sit on top of a cabinet. The scraps are sorted by colour. Ha! I wish I had a good system for storing scraps. The best one I can offer is to throw them into a basket. That's where mine are....with a few dozen on the floor. I have some of mine organized by color but really need to do some reorganizing. I store my scraps by shape and size. If something is an odd shape, I will cut it down to the largest square or strip I can then add it to the baggie with the rest that size. The largest I cut is a 10" square. If it is larger than that it goes in a tub of "chunks" that is organized by color. I used scraps to create fabric to make fabric boxes for each color. Currently I'm making a scrappy string quilt! The lovely colors of all the different fabrics are the BEST! I love scraps. I am working on a cathedral window quilt and scraps are what I am using for the windows. Hope I win because I do love me some scrappy material. I sort only by size. Maybe one day I'll be motivated enough to sort by size AND color. Glad to find your blog. You are on my list of "favorites." My storage method is plastic bins (to keep the bugs out) by color and/or by collection. This is going to be fun to watch! I sort my scraps by color in plastic bags. I also keep the washed fabrics separate from the unwashed ones. My larger ones, about a fat quarter size I fold and stack in a cabinet with glass doors. Right now all my scraps are in one bin. The rest of my stash is 2500 miles away! Scraps, scraps, scraps...strings, strings, strings??!!!!!! 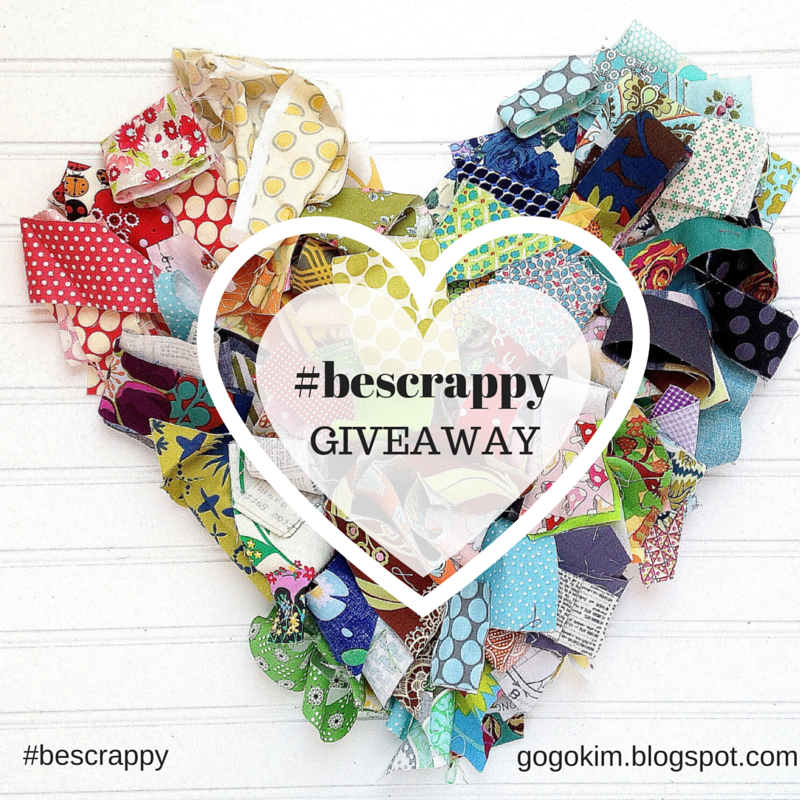 What a fabulous giveaway and I am looking forward to hearing more about scrappy quilting. Being a beginner I thought a few little jars would be a good idea to put my smaller pieces in but some are already overflowing. I will have to rethink my scrap system. I use my accuquilt and cut them in strips, then by size and color. When the stash gets large enough it's string quilt time. I've been quilting for about 18 months now and have three bins of scraps. I've already gone through them once and pulled out a lot of the blue and yellow and I'm currently working on a scrappy project but I would certainly love to have more scraps! I can't wait to see what you do! Bonnie Hunter has the best plan for sorting and using scraps. I haven't gotten there yet, lol. I do have scraps, but right now they are in a box from the move. I have to get a sewing desk, and then I can get them organized. Oh please, I would LOVE your scraps to come live with my scraps. I store my scraps, cut down into strips, squares, logs, triangles in a set of plastic drawers from Target. I have a large cabinet and sort by colors - I try and use them up fast! thanks! I store my small scraps in plastic shoe boxes by color. You can't have enough scraps! I try and store both in colours and shapes, have one container of strips, one of HSTs, 3 of larger pieces and one of tiny pieces, love scraps!! This is a lovely giveaway! Thank you so much! I store my scraps by color. Modern and reproduction and print and solid are kept separate. I tend to cut my scraps in squares, but keep larger parts as they are. I leave them in plastic containers. It works for me, but I am always on the look out for newer organizing methods! I think the organization helps so much in whether I tend to use the scraps or not. These scraps would be an awesome addition to my scrap pile! They would add some pop! Thanks for the opp! I have a big tub under my cutting table. It is overflowing and is on my to do list. I have them kinda sorted by size. Strips in one box, squares in another 2 inch squares in a utensil drawer holder from the dollar store. I saw your post on Instagram yesterday and can't wait to see what you create with your stash that will inspire us to get using ours. I have my stash sorted by colour for larger pieces in clear plastic bins, I also have smaller pieces sorted into bins depending on their size. Everything goes into a bin in front of my sewing machine to be sorted when there is a pile. Right now I store my fabrics according to color. I'm a very unorganized "scrapper"--I just throw everything in a box! Hoping to get more organized soon! I just have a basket that I put them in. Not very organized! Oh Scraps I love them, although not to organized I keep them KIND of just kind with projects in mind. Brights, soft colors, etc. Thanks for the chance to win. Ha! Why do your scraps look more fun than mine?! I want yours :-) Love reading your adventures. I just store my scraps in plastic bags by color, nothing fancy. I've read a ton of scrap storage plans and they've made my head bounce around like a ping-pong ball! I finally decided to cut my scraps into strips measuring 1.5, 2.5, 3.5, and 5 inches. This way I can use them as strips or cut off the squares as needed. I absolutely love sewing scraps!!! They are perfect for QAYG! I love using this technique to make pouches & any small projects! It's a great way to take small pieces of fabric to make something unique & beautiful! Thank you so much for this giveaway!!! My *current* scrap storage system is on big bucket for large scraps and two jars for low volume and dark tiny scraps. My favorite scrap system I have seen are the color coded fabric baskets. So pretty! I am going through my scraps now and cutting them into useful sizes (I hope). So far, I am using stackable plastic containers but I am looking for something better. I keep my scraps separated by color in tubs:) Works for me except if I want a really scrappy quilt then I have to just grab a handful from each tub and mix them up:) ha ha!!! Keeping scraps sorted by color in clear containers helps me. I try to fold my scraps neatly before putting them on the closet shelves with same color families. I only have a ziploc of scraps so I don't really organize them. I love the idea of cutting them into useable sizes! when i finish a project i cut the scraps into 1.5, 2.5, inch strips and 5 in charm squares abd sirt by color. I love how a variety of colorful scraps can put a smile on my face! I usually sort by color only, no size requirements. Thanks for hosting this great giveaway! I use gallon size ziplock baggies, and sort them by color. Woohoo, what a great scrap giveaway! I would love to add them to my small collection, which I have trimmed down to MY usable pieces -- squares, rectangles and strips. Thanks. I don't have too many small scraps as I seem to over buy fabric. My scraps are larger and folded in with the other fabrics. The little bit of scraps I do have are in baggies. I usually sort by size, and then use them in scrappy quilts. I have a tin Easter bucket from Germany that I randomly throw scraps into with great glee! some of my scraps go into small plastic colored bins, like from the dollar store. So red scraps into the red bin etc. Would love to sew up your scraps!! I have tried storing them by size but that was hard to keep up so Now I just store them by color in clear shoeboxes. I do alot of paper piecing and that system has worked out well for me. Thanks for a great giveaway. I won a bag of scraps a couple of years ago and it was a real treasure! I try and cut my leftovers into strips, then sort them in cutlery baskets, according to color and width. But I'm not very good at keeping up with it and many of my scraps are crammed into plastic storage drawers. But at least I know where they are. Thanks for this awesome giveaway. Aurifil thread is the best! I love scraps! My fabrics are pretty well all scraps, but as a ew quilter, I don't have a large and varied stash, so winning this would be awesome! Thanks for the opportunity! I cut my scraps into squares, strips, etc so I have them ready to use when I need them. Some of them are as small as 1 1/2 inches to larger 3 1/2 inches. After cutting them, I then put them in clear plastic containers which I have labeled according to size. That way they are easy to find and ready to use. I keep my scraps in clear plastic drawers, I keep telling myself that I should organize them by size and color but that hasn't happened yet....I LOVE scrappy quilts! I sort my scraps by color, each in their own plastic bin. My scraps are in an office paper box. I try and get into it when ever possible. I have been known to box up and mail to a friend when I get to a second box. I sort by color family and store in clear bins! I keep my solids and prints separate. I also separate into strings, and large scraps. I've only recently began saving smaller scraps- for now I'm throwing them in a pyrex bowl untilI can decide what constitutes a small scrap. Well, since I am a newbie quilter, my scraps don't amount to much yet. I plan to organize them by color in plastic drawers/or totes. I would love to win your collection of scraps that I might create something wonderfully scrappy with them! I don't have any brilliant ideas for scrap storage. I keep scraps in color-family baggies for now! I've tried Cut the Scraps by Joan Ford, and I like it. But always looking for additional help with scraps. I LOVE my scraps. I use my scraps. I am a scrappy quilter. I store mine in plastic bins sorted by sizes and color.I always can use more scraps,I love using other people's scraps too. Lol! I like to separate my scraps by color in plastic bags. When I need a certain color I can take whatever bags i need to my other fabric to match what I need! I organize my scraps by category.....batiks, modern, reproduction.....and I love scraps and Aurifil! Thanks for the chance to win! My scraps are somewhat organized if they are squares,triangles or strips but there are boxes of odd size pieces that need sorted in some way. I love scrap quilts, and I use most of my scraps. Thanks for sharing yours! My system is to store the left-overs from each project in a shoe box. I keep scraps from my clothes I make together so I can make a quilt that goes with the clothes. I store scraps in colored bins that match their color. Need blue scraps? Grab the blue bin! One bag holds just the printed selvage edges from fabrics. The rest are in a plastic tote. Out of sight out of mind! I sort by color and type of fabric (cotton, flannel, batik, metallics, etc.) with selvages cut off and in their own containers. I am a newbie and all of my stash fits into a shoebox. I would love to inherit your giveaways. Hiya!!! I am a scrap collector. I even have my guild members bring me their scraps. If they're too small for me to use, I put them in dog beds for the local shelter. Right now I use the plastic shoe box bins to separate by color. I do like Lori Holts' way of storing by size and color too. Thanks for having the giveaway, it's very generous of you. Blessed be, hugs!!! LOVE the coral and teal fabric in the picture! Can you tell that I love my scraps? I confess it makes me sad and a little panicky when I start to run out of them? I store most of my scraps in two baskets and a pillow case. The two baskets hold the bigger scraps and the pillow case is filled sewed shut and donated to the local animal shelter for kittens. They either wash them or just toss them when soiled. My favorite scrap tip is...plastic drawers. I have a set of 5 on rollers! 2 colors per drawer and when they get full, I cut to the largest size and organize from there! Then I love to make postage stamp quilts! I cut my scraps in strips in sizes I use often and store them in plastic containers. Also keep a container of just 1.5" squares and one for 1.25" squares. Odd size pieces go in a large container. I do keep a basket on my cutting table where I put little leftover pieces in. Makes it convenient when I am making a scrappy block to just use stuff in the basket! Thanks for the chance to win. I started cutting my scraps into squares ranging in size from 1 1/4 inch to 2 1/2 inches. Hope to make a postage stamp quilt. Cut them into usable sizes as you make them and store by both size and color. I love scraps! I cut my scraps into strips and squares. I keep them in clear totes. I'm not very organized, I just toss everything in a big clear box! I am constantly on the lookout for the "best" scrap storage system, but am trying to accept that when you're congenitally messy, there may not be one!! I do adore scraps, and I have my fingers crossed to get some of yours!! I just throw everything willy nilly into plastic bags. I really need a better way to organize it all! Thanks for the chance to win! If the pieces are large enough, like leftover strips, into a box to make pieced backs for quilts, smaller but good size into a box for applique and if there a really large pieces, then back to the stash for use in other projects. I have scraps stored into plastic zip bags by color, scraps stored in plastic storage draws by sizes and scraps stuffed into plastic sacks with no organization. When I have time I cut my scraps into usable sizes (strips/ charms) or strings for string blocks. Recently I've been making muslin bags, and stitching a scrap of the color family(ies) like orange, coral, etc to the outside of the bag. Then I can at least look at my scrap to see what color might be inside the bag. I like to store my scraps in my epp container to use with my eep quilt. Sort scraps by size - I collect 2.5 " squares and keep them in a separate box. Plastic bags within to sort by color or theme. As a new quilter I don't have many scraps but when I do I put them in plastic bags according to colour and when I have enough Ai make little zippered pouches as quick gifts for friends. I'm new to quilting and don't have a lot of scraps, so it would be awesome to win! I sort my scraps by color. When I need something, I can find it easily, or I can group together some scraps to make something new. I started out by just shoving scraps in a large basket. I never used them! When I changed to keeping them in various clear containers sorted according to color , I began to use them! I store mine I. Tubs, but I am looking forward to your ideas on how to use them! I store mine in wire baskets. I cut them into strips and squares. I sort my scraps a few different ways. All my nautical stay together, all my batik, all solids, and all Christmas. From there, the rest is sorted by color into bins and Ziploc bags. makes it easy to grab what I need when I need it. I sort my scraps by size. When I'm completely done with a quilt, I cut my scraps with a rotary cutter into the biggest strip I can,and store them by size. I've been thinking about sorting by color though. I have a big box I throw them in and then when a pattern calls for a small piece I start digging, LOL! Guess thats not really a tip but I just love looking through the box :-) Thank You! Do I need any more scraps??? Silly rabbit, scraps are for quilts!!! I love using scraps. I like to have a place for everything, my quilting teacher once said that every Friday she cleaned up her sewing room even if she was in the middle of a sewing project so I try to do the same. My scraps are contained in clear bins and sorted by colour and then by types for example, flannels, civil war, children's and novelty etc, my sewing room is in a bedroom so my hubby put shelves in the closet and they nestle there really well. I can get them easily. I have so many scraps..but you can always use more...I try to keep them contained by color in clear shoe boxes..but a couple of colors are exploding! I'd love some scraps. I want to make a scrappy log cabin. I ave been working on my stash and trying to bring all those scraps into quilts. I have it under control at the moment! I have them in a big drawer with dividers for colors.